A fun kids song about the joys of eating an egg sandwich. Proceeds from the song go to children's hunger charities. Chris Cates is a prolific recording artist who constantly releases albums and singles, builds large scale solar farms and chases twin toddlers around the house. 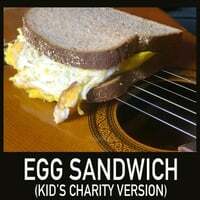 "Egg Sandwich" is Cates's first full on kids song, although he has released a relaxing classical music album called Music for Newborns. Possibly the "greenest musician in the world", Cates performs as a solo artist and with his award winning band Chris Cates and the MasterPlan. For excruciatingly more detail go to chriscates.com.